PHILADELPHIA (AP) — A road rage suspect seen on surveillance video hitting a man with a sledgehammer after smashing the windows out of a vehicle is being sought by Philadelphia police. Video of the parking lot attack was posted online by the police department Wednesday. 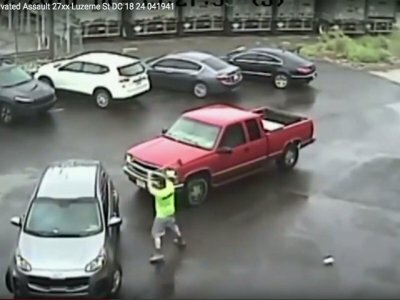 It shows the assailant exiting his pickup truck with a sledgehammer and busting out the driver’s side window of an SUV. A passenger in the SUV then opens his door and falls out as the driver tries to speed away. The attacker hits the passenger with the sledgehammer as he limps off to get back in the SUV. The man with the sledgehammer then smashes the SUV’s rear window as it drives off. Police are still trying to identify the attacker and the victims.